ICO slaps TfL over Oyster data hoard | The Register – So if you want to get your child's discount you have to hand over their identity details to TfL so they can track them – must not stand. Just as open societies have, since the Reformation and the Enlightenment, been the pre-condition for the social, cultural, scientific and technological innovations that have created the modern world – with all its flaws a better place to be a human than any time in the last 50,000 years – so open standards and open systems have provided the underpinning for the network world. Civil Service: Participation online guidance – Excellent advice for all of us who venture online, not just civil servants. 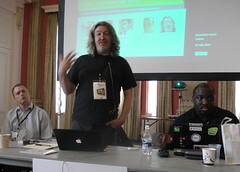 Jem’s picture of me in action at yesterday’s Media Futures Conference, which was a lot of fun. In her recently published book ID: The Quest for Identity in the 21st Century, Professor Susan Greenfield brings her considerable expertise as a neuroscientist to bear on the question of whether and how our current use of computers is changing the way our brains work. Greenfield argues that the visual stimulus we get from screen-based information and entertainment differs so markedly from that available to previous generations that certain areas of the brain, specifically those areas that are older in evolutionary terms and retain the capacity to alter as a result of experience, may be affected in ways that express themselves a changes to personality and behaviour. It’s an interesting hypothesis, and one that has the virtue of being experimentally testable, unlike many other claims about the effect of modern living on human psychology. The chances are that I’ll be getting a letter from my internet service provider in the next few weeks telling me that they’ve been watching my network activity closely and think I’ve been breaking the law. Virgin Media, who used to be called ntl before they acquired Virgin Mobile and turned themselves into a ‘four-play’ media company, has announced that it is working with record industry lobby group the British Phonographic Industry to write to customers whose network connection seems to have been used to download unlicensed content. 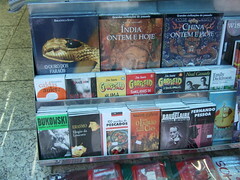 On a random bookstand along Av Paulista. I can’t imagine finding Bukowksi, Baudelaire, Neal Cassidy, Anais Nin, Erasmus, Emily Dickinson – and Garfield – for sale on a stall in the UK! 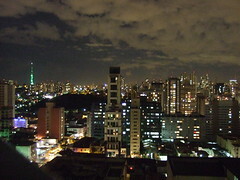 This is what it looked like on the 15th floor yesterday evening around 8pm local time. The city just goes on and on, in all directions, stretching around me. I’d swear it was growing as I looked. Today has been a lot of fun with Mark and Sarah, also here for the conference. We went to the Museum of Art, a fabulous modern building on Av Paulista, with some wonderful European work (Titian, Botticelli, Monet, Picasso) and some great modern Brazilan stuff too. Then lunch in a little restaurant filled with people on their lunch break – no real sign of tourists around here, it’s not that sort of city. And now back at the hotel for a break and to catch up on work stuff and prepare for tomorrow’s talk.